At a symposium on Thomas Becket at Lambeth Palace on the feast of St Augustine of Canterbury, 27 May 2016, Cardinal Vincent called for a broadening of a constructive dialogue between secular authorities and communities of faith to meet today’s challenges, so our multiple and complex identities and loyalties can be brought together, rather than separated out to meet the challenges we face. The Cardinal rejected the narrowing of a perspective towards a single test of loyalty that would serve only to betray the complexity of our human nature and impoverish the richness of the fabric of our society. Looking back to Pope Benedict’s address at Westminster Hall in 2010, he affirmed that ‘religion is not a problem for legislators to solve, but a vital contributor to national conversation,’ and for all of us 'to defend those arenas of life in which true religion flourishes, open to the challenges of its’ day yet confident that its’ insights and gifts are so rooted in human reality as to possess qualities that truly endure'. The aim of the symposium was to explore the importance of Thomas Becket, historically and today, in the week that one of his relics was brought back to the UK from Hungary, where it had been kept at Esztergom since his martyrdom in 1170. Following services at both Westminster Cathedral and Westminster Abbey, the relics will be taken to Canterbury, the site of his murder. St Thomas Becket is patron saint of both English and Hungarian parochial clergy and a reminder in his martyrdom to all Christians of their dedication to Christ rather than the prevailing powers of the state, helping us 'to remember and focus on this fruitfulness of courage and faith which is always the seed of the Church'. Cardinal Vincent noted that 'Pope Benedict went on to argue that ethical norms are accessible to right reason, and that religious faith, rather than see itself supplying those norms, can illuminate and deepen the perception and appreciation of them. He proposed a "corrective role" for faith in the application of reason noting, and I quote, "that this corrective role is not always welcomed partly because distorted forms of religion, such as sectarianism and fundamentalism, can be seen to create serious social problems themselves. And in their turn, these distortions of religion arise when insufficient attention is given to the purifying and structuring role of reason within religion." 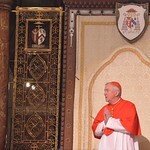 The full text of Cardinal Vincent's address can be read here.